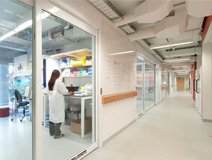 In June 2009, Harvard University began the design of an ambitious two-year renovation of the existing Sherman Fairchild building at 7 Divinity Avenue in Cambridge to accommodate Stem Cell and Regenerative Biology (SCRB) research. The primary purpose of the project was to provide exemplary workplaces for both research and academic staff in a healthy and productive environment, while achieving robust sustainability goals at a competitive capital cost. This project reflects Harvard’s commitment to sustainability and to building healthy and productive workplaces that support the University’s academics and research mission while reducing the impact on the environment. The project scope included the complete demolition of interior finishes and mechanical systems in this 107,000 square foot, four-story building, while the building structure and envelope remained largely unchanged. The program provides open lab bench space, tissue culture labs, microscopy rooms, zebra fish labs, interior lab support spaces, conference rooms, and offices. Revitalizing an existing building and increasing the number of occupants are two of the many sustainable aspects of the project. The new, highdensity open lab layout encourages interaction and interdisciplinary research amongst the 340 SCRB staff, researchers and students, while affording the necessary flexibility for future development in working methods. These healthy, productive and creative workplaces maximize use of daylight and fresh air while optimizing an indoor environment that responds to a range of specific indoor demands. The project team was committed to sustainability from the onset and throughout the duration of the project. The Sherman Fairchild renovation was the first project to be guided by Harvard’s comprehensive Green Building Standards (adopted in 2009). The processes required under the Harvard Green Building Standards allowed the team to make more informed decisions by mandating thorough integrated design, energy modeling, and life cycle costing. By undertaking these methods, the project was able to include number of progressive design strategies to meet aggressive energy targets and reduce water use without significant additional cost. The project achieved LEED-CI v3 Platinum certification in March 2012, and is tied with a project in Hong Kong for the highest number of LEED-CI points achieved by any project in the world (and the highest for any LEED-CI lab).